You may think with summer in full swing, seasonal allergies went out the door with the rains and flowers of spring. Oh no, dear friends, allergies are still alive and well and kicking the literal snot out of sinuses both near and far. The people over at Honeywell compiled this handy little infographic illustrating the top 10 allergens in America, as compiled by the Allergy and Asthma Foundation of America, and we thought you might want to take a gander. As a person who’s undergone extensive medical interventions to alleviate extreme sinusitis and environmental allergies, this list only has a couple of surprising allergen sources (cockroaches?!). It bears keeping in mind, however, whether you’re working outside or inside on your latest projects to be cognizant of what all you may be stirring up alongside the expected messes that come with DIY. For example, tearing up carpet may bring a host of gross upon you, depending on the location of the carpet and what all lived upon the carpet before its removal. Even simple tasks like cutting grass can have some serious ramifications for someone with severe plant- and pollen-based allergies. Add to the mix the heat of summer and things like humidity and smog and things can actually get pretty scary pretty quickly. 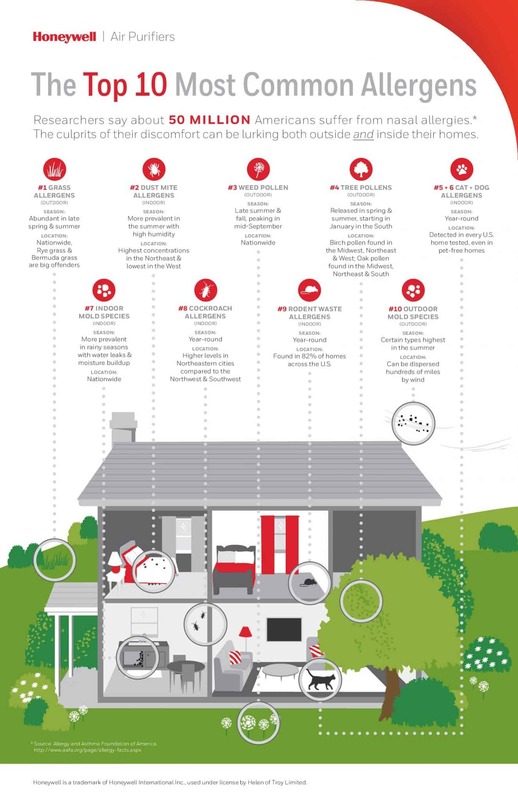 We think this is a great guide to keep handy to remind yourself how to keep your home and yard as allergen-free as possible, whether you’re building from scratch, moving into your next project or new home, or just need a good deep cleaning. Later this week we’ll be reviewing the brand-new Honeywell Smart Bluetooth True HEPA Air Purifier unit, which touts a designation to fight the most severe indoor allergens from the #1 brand recommended by allergists, and letting you know how it’s performed during some of the highest allergen count days of the summer thus far.